Terminator Salvation is a 2009 post-apocalyptic science fiction film from director McG. It is the fourth film in the Terminator film franchise. The film is set in the year 2018, and focuses on a mysterious man who joins the resistance on the eve of an attack on Skynet, but whose side is he really on? Seven years after the debut of The Terminator (1984), its sequel Terminator 2: Judgment Day arrived in 1991. 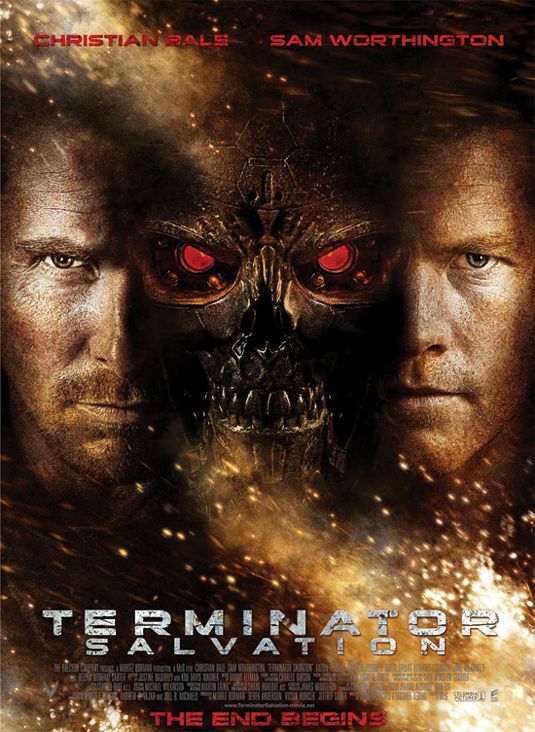 It was another 12 years before the third film, Terminator 3: Rise of the Machines (2003) debuted, but only six years later, the fourth film, Terminator Salvation arrives. This shorter gestation period likely isn’t why Terminator Salvation is good enough to be considered the second best film in The Terminator franchise. Terminator Salvation finally takes us into the world only hinted at in the other Terminator films – the post-apocalyptic future that finds the remnants of the human race fighting the all-powerful artificial intelligence, Skynet, and its army of man-killing Terminators. John Connor (Christian Bale) is the man fated to lead the human resistance against Skynet and the Terminators. It was his mother that Skynet marked for termination before she could give birth to John, so they sent a Terminator back in time to kill her (as seen in The Terminator). In Judgment Day, Skynet sent a Terminator back in time to kill a 12-year-old John Connor. This new film opens in 2018, and John Connor is not in charge of the Resistance. Connor continues, however, to study his past, through his memories and through the tape recordings his late mother left, as he tries to determine what Skynet’s next move might be. Then, Connor learns that Skynet has made a human civilian named Kyle Reese (Anton Yelchin), their top priority for termination. Reese is a man who is of utmost importance to Connor’s existence, so Connor prepares to launch a rescue mission even if General Ashdown (Michael Ironside) and the Resistance leadership are against it. Then, Connor meets Marcus Wright (Sam Worthington), a stranger whose last memory is of being on death row in 2003. It seems that Wright’s appearance has altered what John knew the future to be. Connor and Marcus embark on an odyssey into Skynet central operations in the ruins of Los Angeles, where they discover the truth of Skynet’s diabolical plans. Any moviegoers that are familiar with the internal mythology of The Terminator films can follow all the twists and turns of this time-bending film franchise… for the most part. Are there inconsistencies between Terminator Salvation and the original film (let alone the others)? Yes, there are, but director McG (the Charlie’s Angels films) takes the script for this film (which apparently had at least six writers, if not more) and makes one of those great summer movies that keeps your eyes glued to the screen and just keeps you awestruck with the awesomeness of its action and special effects. It’s fanboy eye candy. It’s easy for critics and snobby fans to dismiss McG (whose name is Joseph McGinty Nichol), but in the case of Terminator Salvation, he makes the best use of his actors, getting superb performances out of Bale, Worthington, Yelchin, Moon Bloodgood, and Jadagrace. Plus, McG squeezes the best from the visual effects, special effects, and stunt crews. When a director harnesses this effort to maximum effect, he can make that kind of action flick that is the Art of the summer movie. There are times when McG and company stumble over themselves in an effort to both connect Terminator Salvation to the original films (especially the first two) and to be respectful of the originals, somewhat to the detriment of this film. However, McG has led his cast and creative staff to the promised land of the great action film, one so stuffed with edge-of-the-seat thrills and breathtaking visuals that it won’t soon be forgotten. The text is copyright © 2015 Leroy Douresseaux. All Rights Reserved. Contact this blog for reprint and syndication rights and fees.